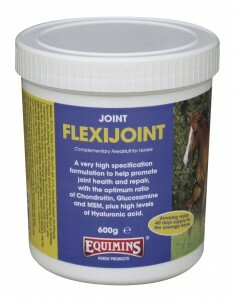 Want to feed your horse Flexijoint but not sure which one to pick? Here’s our quick guide to Flexijoint joint supplements! Don’t forget that we’re at the end of the phone or can be contacted by email if you need help – don’t hesitate to get in touch! High levels of key ingredients. 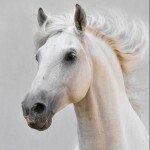 In each 20g serving (enough for a large horse of 16hh plus) there is 4000mg of chondroitin sulphate, 8126mg of glucosamine Hcl, 4819mg of MSM, 1000mg of ascorbic acid and 60mg of hyaluronic acid, in addition to other ingredients. Many people feed less than the suggested amount and still report great results. Available in 600g, 1kg, 1.5kg, 3kg, 5kg and 10kg quantities. Based on pricing as of Aug ’15, if a 1.5kg tub was purchased, it would cost 78p per day to feed (horse 16hh plus), 59p per day to feed (horse between 14hh – 15hh) or 39p per day to feed (horse up to 14hh). High specification joint supplement that helps to support healthy cartilage, strong joint structure and the quality of the synovial fluid. Combines the benefits of the powder in a devils claw base for further nutritional support for stiff joints. High levels of key ingredients. In each 20ml serving (enough for horses up to 16hh) there is 4000mg of chondroitin sulphate, 7000mg of glucosamine Hcl, 4000mg of MSM, 1000mg of ascorbic acid and 25mg of hyaluronic acid, all in a liquid blend of devils claw herbal tincture and glycerine. Available in 1L, 2.5L and 5L quantities. Based on pricing as of Aug ’15, if a 2.5L bottle was purchased, it would cost 54p per day to feed (horse 16hh plus), 43p per day to feed (horse between 14hh – 15hh) or 33p per day to feed (horse up to 14hh). Combines the benefits of the powder in a bromelain base for further nutritional support for stiff joints. Bromelain is a derivative of pineapple. High levels of key ingredients. 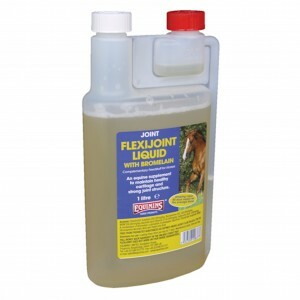 In each 20ml serving (enough for horses up to 16hh) there is 4000mg of chondroitin sulphate, 7000mg of glucosamine Hcl, 4000mg of MSM, 1000mg of ascorbic acid, 600mg of bromelain and 25mg of hyaluronic acid. Based on pricing as of Aug ’15, if a 2.5L bottle was purchased, it would cost 56p per day to feed (horse 16hh plus), 45p per day to feed (horse between 14hh – 15hh) or 34p per day to feed (horse up to 14hh). If you’re still not sure which product would best suit your needs, please contact us.